Week for was an exciting week! First I started off with some user flows describing what i want all the features that I am working on to do. User flow 1 describes the Peek a Boo feature. User flow 2 goes over the nav wheel and hamburger menu flow. User flow 3 is describing the AR Features I would like the app to provide. Next I created some HiFi sketches to further define the visual style that will go along with the actions mentioned in the User flows. After making sketches, I brought them alive to mimic the descriptions in my user flow using Prinicple. Purpose: The purpose of this series of usability tests is to test the Home Nav Screen of our IxDA Conference Application. 1. To see if the user can Navigate to the 4 main submenu areas of the app. 2. That they can return back to the main page. 3. To test the Peek A Boo feature to see if it is intuitive. 4. Test help key overlay to help people navigate. 5. Test AR prototype to see if it is something that would engage user. Method: We will be doing a series of moderated usability tests using an iPhone simulated on a computer screen to collect mouse clicks and video of the respondent. Moderator Roles: One Facilitator, Two Note Takers. _ Quicktime Pro to capture. _ iPhone for AR Prototype. 1. Before clicking on anything and seeing the Home Nav Screen for the first time, have user make their best guess on what content will they see if they click on the various icons. 2. Have User click on help overlay icon to display the categories and peak a boo feature graphic. 3. Have user describe icon they would expect if the ones provided added confusion. 4. Ask user to try the Peek A Boo feature. 5. Have User navigate to the four main points and navigate back to home screen. 6. Have user test 2 interactive ar prototypes and record their reaction/thoughts. This week in class we went through some ideation workshops to build on from our findings in our research. Our assignment was to make sketches based on the ideas we came up with in the workshop for features we can use in our Conference Application. My first sketch was exploring the AR Interaction between Sponsor and Attendee from pencil sketch to a digital one. One name for the system I am playing with at the moment is IxDA Enhanced (which would open this up to more than just sponsor exchange. 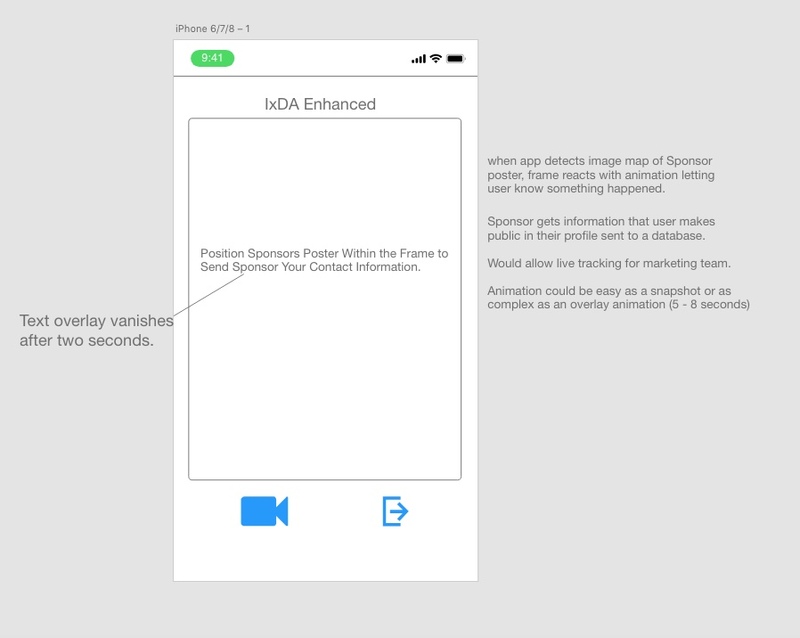 Wherever people see the IxDA enhanced logo they would know they could use this part of the app to see an interactive experience). My next step for this sketch is to storyboard the experience to help communicate the process more easily. Prototyping this effect may not be possible in the time frame given or this feature won't be picked up for the group project so I want to take this idea as far as I can so after the capstone project ends, I can research this more. I am calling this idea, "Peak-A-Boo". If you slightly hold and drag the home screen down it reveals your next event (bonus points if inside the "nav-wheel ((working title)) a small compass would appear and point to the location of event). If you pull full down, brings the user to schedule. Also made some sketches for even listing, searching, and filtering. My final sketch this week is just a quick exploration of how a quick access map could work. In week two all of the IxDA groups formed a supergroup to create an affinity map to create a vision and foundation of our project. The super affinity map we made. Next, we agreed to meet in person on Thursday to brainstorm a bit as well as tasks to complete and share. My task was to create a site map of the last app for this event. Other group tasks are a survey of conference goers and site comparison. We set a deadline of sending out the survey by Wednesday and have the other items of research ready along with survey results by next class. Here is the site map of the Interaction 2016 event. Event has a ton of speakers to navigate. Was overwhelming and could have been organized. Make app die gracefully. This app has not aged well as pictures and other content have vanished. Titles for events are very long. My capstone project for the SVC UX Design Certificate Program is a ten-week course in which we split into teams and tackle a real-world UX Design Scenario. Two pitches were made. One from IxDa (Internation Interactive Design Association) to make a conference app the other was Town Hall to rebuild their website or build an app. The IxDA Conference Application seemed like an excellent opportunity to explore Augmented Reality in practical applications. Next, we formed into groups and once our group was formed we established that Google Drive would be our shared workspace, slack would be our preferred method of communicating when outside of class or in-person meetings, and established a team document to share early ideas. On our own, we did a little brainstorming. I began on paper with pencil to explore some options that could take advantage of image recognition tools for AR. Idea Number 1: Image map badge to show "Holographic" welcome message through the app to encourage early adoption of the app. Add a cool little digital prestige people could show off to colleauges. More brainstorming about a welcome animation for the app. Coming up with possible roadblocks that may occur. One topic of research I already found I need to explore is the average attention span endurance for an AR animation. Idea number 2: Apple Watch Compass. User would set preferences in phone app for easy way finding (up to 4 at a time). Idea 3: Each sponsor booth would have a custom poster (wilderness theme. maybe famous PNW photographers, local Design School Students) that would be imaged mapped into the app. Apple ARkit and Unity both use the Vuforia AR plug-in which makes an image and object mapping possible pretty easily (or as easy as it can be). When the app identifies the unique target, it triggers two actions. Action One is that it transmits the user's profile data (after they have given it permission to do so when setting up the app) to a database the Sponsor can access and monitor real time if needed. This would save them many hours of having to type in business cards into a database (not to mention having to lug all the cards around) and also allow for real-time marketing information to the sponsor's office if they are not at the conference. Action Two bookmarks the sponsor on User's profile. When the user wants, they can visit this area and have the option to download a digital brochure or link to a website. Idea 4: A poster that is targeted. When app detects target, shows 1) A preview video (trailer) or 2) LIve Feed. The live feed would be a great way to peak in to see if the room is full without interrupting the presentation. My next step was to evaluate Vuforia. After a few hours, was able to get first results. Screenshot of Unity using Vuforia. I started with Vuforia in unity, and using my laptop webcam was able to have a reaction when target map showed up. Next, I wanted to add a little complexity to the app. So I built a small scene. Next steps: Meet with group and figure out what we are going to do. Flesh out AR ideas and research prototype. Probably only room for one or two AR ideas, don't want to over gimmick.